The real magic is in the software. Lenovo is taking its future in VR very seriously -- after all, it just outed a new VR headset that won't completely break the bank. Here's the thing, though: We're going to need a lot of content for these things, and that's where Lenovo's new Legion gaming notebook comes in. It's set for a launch this coming April (which should be well before that new headset hits), but we already got some hands-on time here at CES in Las Vegas. The Legion Y720 retains the look of Lenovo's Ideapad Y-series, but ditches that milquetoast branding in favor of something a little more fun -- better for competing with other PC makers' gaming brands, or so I'm told. The $1,399/£1,300 base model comes with a 15.6-inch display and an Intel i5-7300NQ processor, with options for up to 16GB of RAM, up to 2TB of storage (if you're down with traditional hard drives) and NVIDIA's GeForce GTX 1060 GPU. Throw in a trio of USB 3.0 ports, a Thunderbolt/USB Type-C port and a 4-cell battery that's rated for about five hours on a single charge, and you've got a well put-together package. 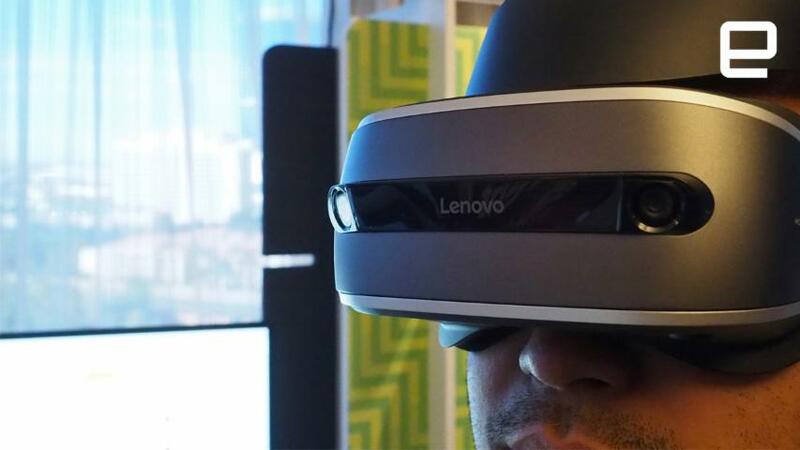 What makes the Y720 such a potentially great VR machine is what Lenovo calls the Entertainment Hub. Long story short, it's a bit of software that acts as a media library where you can upscale movies and games for use in VR. I strapped on an HTC Vive headset to put the Entertainment Hub through its paces, and the results were better than expected... even if the approach is a little unorthodox. Once you're strapped in, videos play in a virtual theater of sorts, where you're surrounded by empty seats (complete with cup holders). Your "seat" is several rows back, offering a solid vantage point as the movie of your choice unfolds. The effect fits well enough when you're watching proper films but I could see it being a little weird for other kinds of video. Gaming through the Entertainment Hub is a little different: The non-final software took a few tries to launch Deus Ex: Mankind Divided properly, but I was dropped into Adam Jensen's world without trouble after that. The thing is, Deus Ex wasn't developed with VR in mind, so while I could move my head to take in the world around me, I also had to move my head to aim at enemies. Sure, I could have used the control stick on the Xbox One controller I was holding, but that required me to keep my head perfectly still as I lined up my shots. Is that a dealbreaker? No, but Lenovo's implementation means having to re-tune how you play your favorite games. Unfortunately, the list of titles for me to test was limited, so I didn't have the chance to see if this head-tracking scheme works better for games in other genres. Lenovo still has plenty of loose ends to tie up before the Entertainment Hub launches alongside the Legion laptops. Spokespeople here at CES couldn't confirm how or if users could import their own media -- home movies and the like -- into the Entertainment Hub. It's also unclear whether you'd be able to purchase new content straight from within the Hub. Despite all that (and a handful of early glitches), the Hub might give Lenovo an edge over its rivals as VR continues to grow in importance.